With two of their three leading rushers under contract for at least two more seasons, the Seahawks are likely to look much the same in the backfield in 2019. It wasn’t just the running backs who deserved the credit for a vastly improved Seahawks rushing attack in 2018 that ended up leading the NFL in yards. But last season’s success proved the Seahawks have what they need in the backfield to make a running game work. And with two of their three leading rushers under contract for at least two more seasons, it also means the Seahawks may not need to do a whole lot to add to their backfield as 2019 approaches. Here’s an overview of the running back position. The Seahawks sent the strongest signal possible about their desire to revive their running game by drafting running back Rashaad Penny in the first round last April. He was just the third running back taken by Seattle in the first round in franchise history, the others being Curt Warner and Shaun Alexander. Many questioned the pick, and whether Penny will turn into Warner or Alexander is still to be determined. But after dealing with three seasons of erratic running back play due largely to an inability to stay healthy, the Seahawks were determined to have enough tailbacks to go around. 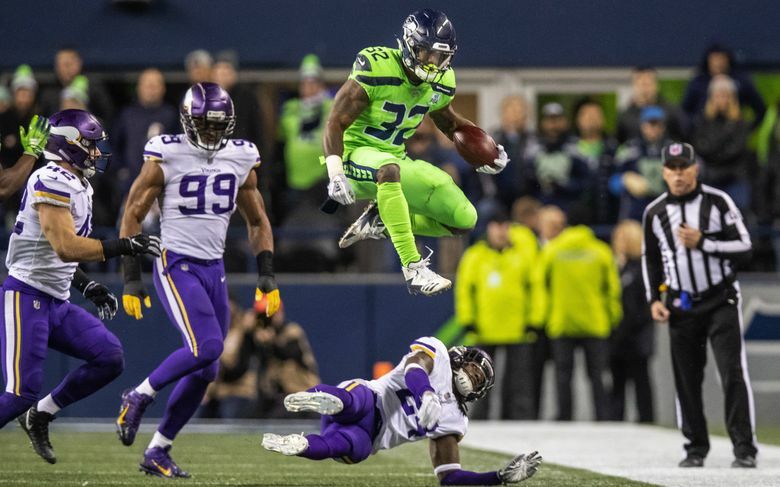 And if more than a few took to social media to mock the Seahawks when Chris Carson ended up as the starter and not Penny, Pete Carroll didn’t seem to care, happy that at least someone could take the ball and run with it for an entire season. Carson did miss two games along the way but otherwise put up the best season for a Seahawk since Marshawn Lynch in 2014 with 1,151 yards and nine touchdowns. Penny dealt with a finger injury early in the year and a knee injury late in the year but showed some flashes with 419 yards and a 4.9 yards per carry average that was the best of any of the tailbacks. Mike Davis proved a competent backup and third-down back with 514 yards and 34 receptions, the latter total the third-most on the team. When it was over, the Seahawks had rushed for 2,560 yards, third-most in team history behind only 2012 and 2014. And while those who study football analytics increasingly question how much a running game matters, Carroll saw no coincidence in Seattle’s rushing numbers and getting back to the playoffs. Key stat: Carson became just the sixth running back in Seahawks history to top the 1,000-yard mark. Contract status: Carson’s rookie contract takes him through the 2020 season. He is due to make base salaries of $645,000 and $735,000 the next two years. He could be given an extension after the 2019 season but not before, via the league’s CBA. Key stat: Penny’s 419 yards were sixth among all rookie running backs in 2018 — he was the second RB drafted at No. 27 behind Saquon Barkley, who was drafted second. Contract status: Rookie deal runs through 2021 season. Key stat: Davis’ 4.6 yards per carry average was a full yard better than in any of his previous three NFL seasons. Contract status: Davis can become an unrestricted free agent on March 13. It will be his second year as a UFA. 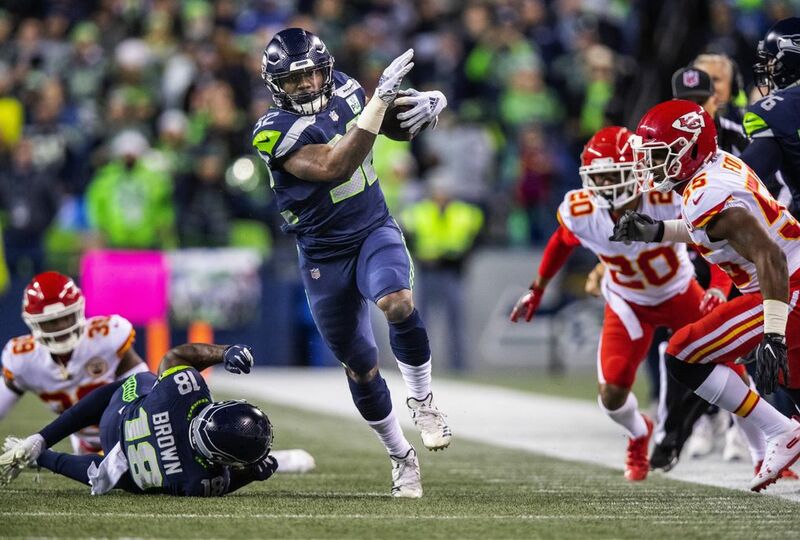 Key stat: Prosise, a third-round pick in 2016, got just one carry all season, a 3-yard loss in a game in Los Angeles against the Rams. Contract status: Prosise has one year left on his initial rookie contract, due to pay him a base salary of $745,000. Seattle would save all of that against the cap if he is cut either before or after June 1. Key stat: Had just three carries for 8 yards playing in five games. Contract status: Is now a restricted free agent. Most likely, Seahawks will not tender him and he will become a UFA. Key stat: Was not active for any of the three games he was on Seattle’s roster. Contract status: Is under contract in 2019 at a base salary of $495,000. Key stat: Played just 86 snaps on offense, but his 254 snaps on special teams were the most of any offensive player and fourth-most on the team. Contract situation: Is also now a restricted free agent. Another who the Seahawks likely wouldn’t tender, making him a UFA, but would then be interested in re-signing at a lesser salary. As noted above, the Seahawks have a pretty good corps going into 2019 with Carson, Penny, Prosise and Scarbrough under contract and McKissic and Madden seemingly pretty easily retainable. That leaves only Davis as a major question. He made just under $1.3 million last year, and he might want more than that in 2019, a number that Seattle might not want to match. Davis’ primary role last season was a third-down, two-minute back. Prosise could fill that role if healthy, admittedly something Seattle can’t count on given that he’s played just 16 games in three seasons. But the Seahawks also might think Penny can do it well enough, if needed, as well as McKissic, if he were to return. Given what Seattle has returning and needs elsewhere, it’s hard to see the Seahawks spending a whole lot in free agency at the tailback spot — the late-season addition of Scarbrough seemed designed for 2019 as much as anything else. But a few free agents who likely wouldn’t cost a lot include Rod Smith, who played last year with Dallas but was with Seattle in 2015; Ty Montgomery, a former receiver and running back with Green Bay and last year with the Ravens, who might be an interesting addition for the third-down role; and Javorious Allen, also most recently with the Ravens who also might be a good fit for the third-down role. After taking Penny in the first round last year, hard to imagine the Seahawks spending much draft capital on a running back this time around, especially with just four picks at the moment. But the Seahawks will undoubtedly look for either any late-round bargains or, most likely, to sign a back or two as an undrafted free agent. Washington State’s James Williams is surely hoping to get in at least the middle rounds. But if he were to fall he might be an intriguing option due to his receiving ability.